This chicken and dumplings recipe is one of my family's favorite meals. It is adapted from one my mother cooked when I was growing up. I prefer white meat, so most of the time, it is made with chicken breasts, though using the whole chicken (deboned) like my mother did works, too. 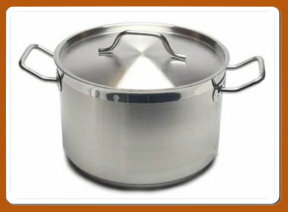 I like to use a large stock pot like the one here. I can make more dumplings, and it doesn't boil over as much as a smaller pot would. When all the dumplings are gone, the left-over soup makes a wonderful base for chicken pot pie. Just add some cooked veggies, pour it into a pie crust, top with a top crust, pierce the top crust to allow venting, and then bake until top crust is golden brown. In a large soup kettle (mine is 8 quarts), cook chicken in water and broth until done. Remove chicken from broth, cut into bite-size pieces, return to broth and simmer. If using a whole chicken, debone the chicken and cut into bite-size pieces. In a large mixing bowl, stir together flour, baking powder, and salt. In a 2-cup measuring cup, measure the 1/2 cup oil, then fill to the 2 cup mark with milk. Pour the oil/milk mixture into the flour mixture and stir with a fork until dough forms a ball. Drop dough in approximately 1/4 cup amounts into the chicken/broth. Be sure each dough ball submerges completely before rising back to the top. Cover with a tight-fitting lid. Watch closely to make sure the heat is low enough to prevent boil-overs. If necessary, lift the lid and lower heat, then replace lid. Simmer for 20 minutes or until dumplings are done. Over the next couple of weeks, I will be posting more of my family's favorite chicken recipes. 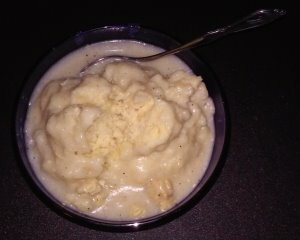 Let me know if you try this chicken and dumplings recipe. I love this recipe! The dumplings are light and fluffy on the inside and the soup in great. I am happy you enjoyed it. Thanks for reading.